After more than 36 years of legendary service, the New Jersey Army National Guard bid farewell to its last UH-1 Huey helicopter. 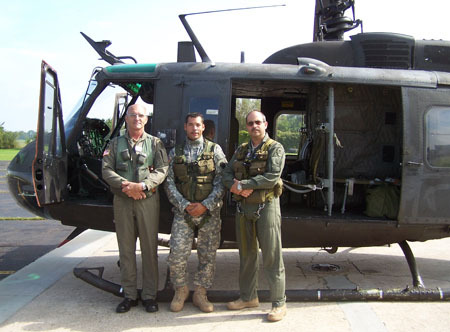 Sept. 6, Col. Jorge Martinez, Chief Warrant Officer Raymond Ferrante and Spc. Dave Debran, departed the Trenton-Mercer Airport en route to Groton Conn., where the aircraft was to be handed over to the Connecticut Army National Guard. On the way to its new home, the last Huey flew over the Statue of Liberty, Ground Zero and all of the Metropolitan area’s major landmarks, as it had done during many flights for pilots and crewchiefs, young and old. Since its arrival in New Jersey in early 1971, the Vietnam era UH-1 Iroquois has been a dynamic presence in military operations, domestic emergencies and community functions. The aircraft and its crews amassed an outstanding safety and performance record, with only a handful of serious mishaps over tens of thousands of flight hours. The most serious mishap occurred in May of 1978, when four crewmembers died during an aerial gunnery exercise in Fort Drum, N.Y.
UH-1 helicopters were present in every major NJARNG operation as far back as our Nation’s Bicentennial, Operation OPSAIL, the Statue of Liberty re-opening celebration, tropical storm Floyd, 9-11 emergency operations and as recent as the Republican National Convention and the Delaware river floods. Hueys also supported innumerable static displays, gubernatorial flights and orientation flights for military and civic leaders and elected officials. Since the early 1970s, the UH-1 fleet supported units in North and South New Jersey, mainly the 150th Combat Aviation Battalion the National Guard Armory in West Trenton and Troop D (Air), 5th Squadron, 117th Cavalry out of Linden Airport and eventually from Picatinny Arsenal. During the past few years, the UH-1 helicopters assigned to the NJARNG gave way to the newer, more powerful and technologically advanced UH-60 Blackhawks. However, the aircraft leaving New Jersey did not go into retirement. Instead, the last three helicopters went to Mississippi, New Mexico and Connecticut to support missions such as Katrina relief, Operation Jump Start and Homeland Security. The last flight had special significance to its pilots. For Ferrante, the flight would bring closure to an aviation career that covered four decades and more than 12,000 flight hours in every continent but Antarctica. For me, the flight would be the last in the machine that helped me rise through the ranks during the last 31 years, first as a crewchief and eventually as an instructor pilot. In the end, the honorable UH-1 left New Jersey the same way it arrived: with little fanfare, humble, reliable, dignified and ready to serve our nation.